Aquarium food booster that features highly unsaturated OMEGA 3 fatty acids, Marine Lipids (200 mg/g), Stabilized Vitamin C (200 mg) and Vitamin B12 Cyanocobalamin (240 mcg). Soak any freeze-dried, frozen food or dried food to give it additional nutritional value or use directly in the tank to benefit filter-feeding invertebrates. Boosts the nutritional value of live brine shrimp. 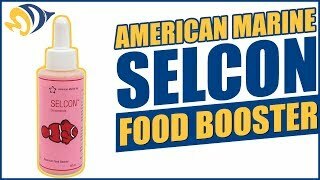 American Marine Selcon does not alter water chemistry and it does not contain Yeast, Phosphates or Nitrates. It also helps cure Head and Lateral Line Erosion / Disease. 60mL. Entices fish to eat. Seems to improve health, weight, and color. Make sure to only use on dry food and let it soak all the way before feeding. Putting it on frozen is a waste as it washes off the moment it hits the water no matter how long you soak it for. i add a few drops of this to there food. they love it..it also makes there color looks even better..it keeps everthing in the tank happy. I've been using this product for years. It really helps get finicky fish started on food. Helps keep my fish fat, healthy and happy! A little goes a long ways. Easy to use and give you noticeable results!